Don’t worry Khloe and Lamar are fine. Forest Jumper was born in the same hippie commune as Crypto Freewater. Her father was a professional basketball player – until his back went out – and her mother a half elf seamstress. 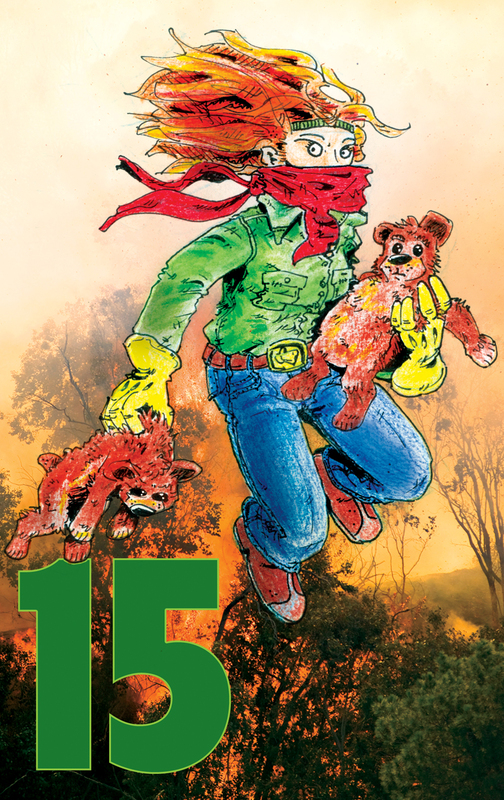 She joined the U.S. Forestry Service and discreetly puts her special abilities to good use saving misplaced hikers and endangered woodland creatures. She is light on her feet, fast as an Olympic sprinter, has hops like nobodies business, and can understand the thoughts of small mammals. A NOTE on the COLOR: I colored this by hand with colored pencils then played with digital manipulation of the original piece. Then I went and used a real pic for the background cause I thought it looked cool. SIDE NOTE: It was actually because I was being lazy. This entry was posted in Miscellaneous and tagged 36.5 Supers, animal rescue, hero, Hoose Too. Bookmark the permalink. I’m just glad you found the picture instead of starting a fire to take one. Also the hair rocks. I used a real background again in another upcoming one and it worked rather well.